Here's your Booze Movies schedule for September. Happy Labor Day! No white lightning is actually consumed in the most famous of all the moonshine pictures, Thunder Road. In fact, very little imbibing of any kind can be witnessed in this cult drive-in sensation. It’s more a movie about the illegal transport of liquor than a story about drinking it. And, in fact, the bootleg business is merely a backdrop for the real concerns of the flick--fast cars and existential angst. Robert Mitchum stars as Lucas Doolin, a disillusioned Korean War vet who has returned to his pre-war profession of transporting illegal corn whiskey for his pa. 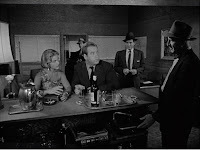 The family business is under attack both by the feds, headed by Alcohol and Tobacco tax agent Troy Barrett (Gene Barry), and by a gang leader, Carl Kogan (Jacques Aubuchon), who wants to take over all the moonshine traffic in the Appalachians. Adding to Luke’s troubles are two ladies (Keeley Smith and Sandra Knight) that are vying for the affections of the emotionally dead veteran and a younger brother (James Mitchum) that Luke desperately wants to keep out of the moonshine trade. 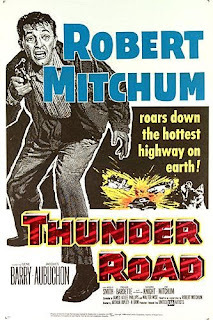 Thunder Road was a vanity project for Mitchum. 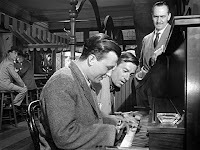 He produced the film, wrote the original story on which the screenplay was based, cast his son in the role of his brother (a part originally intended for Elvis Presley), and even co-wrote the film’s two original songs. 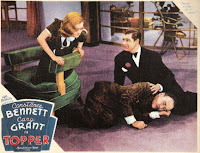 Financially, the film was a great success. Next to The Rocky Horror Picture Show (1975), Thunder Road has probably had more theatrical screenings than any other motion picture; and it was a staple of drive-ins from its original release through the 1980’s. However, Thunder Road isn’t quite as successful when assessed on the merits of its narrative and production values. In no way is Thunder Road a bad film. In fact, compared to other vanity projects--Hudson Hawk (1991), Battlefield Earth (2000), Glitter (2001), etc.--it’s a masterpiece. 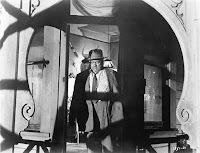 However, the film does suffer from some mediocre acting (with the exception of the always reliable Mitchum), hokey dialogue, continuity errors, and lackluster direction. The story is also a bit schizophrenic. With touches of film noir, hillbilly corn, hot rod chase, gangland drama, love triangle, and police procedural, the picture never truly settles on what it wants to be. Still, Thunder Road is never boring, and its individual parts are worth the ride. Potent Quotables--THEME SONG CHORUS: Thunder, Thunder, over Thunder Road. Thunder was his engine, and white lightning was his load. Moonshine, moonshine, to quench the devil’s thirst. The law they never got him, ‘cause the devil got him first. Similarly Sauced Cinema--Mitchum hit the bottle in Howard Hawks’ El Dorado (1966). The subjects of documentaries often prove that real people are more fascinating than any characters that can be fashioned out of the imagination. Jim Tom Hendrick, the focus of Kelly L. Riley’s documentary short Moonshine, is just one of those subjects. An aging denizen of the hills of North Carolina, Jim Tom spends his days focused on the semi-conflicting interests of the Bible and the production of corn liquor. With Jim Tom as our tour guide, the film leads us through the process of distilling moonshine whiskey; but the short also takes the time to stray from the bootlegger’s hidden mountain still to give us a view of Jim Tom’s community and way of life. Despite his secretive pursuits, Jim Tom proves himself to be a completely open and unguarded subject for a documentary filmmaker. 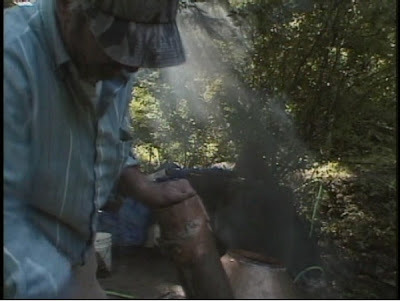 The moonshiner is unembarrassed to let Mr. Riley follow him around, as he digs through garbage bins, displays the scars from his multiple car accidents, and blows into a breathalyzer in order to start his car. Jim Tom is obviously content with his simple way life. As his sister states, “He says as long as he has a loaf of bread, and a pound of bologna, and a pound of cheese, he fine.” However, I imagine Jim Tom would add a jug of white lightning to that list. 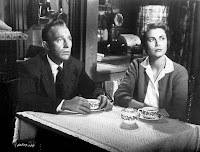 Although the short was shot on a shoestring, Kelly L. Riley managed to squeeze the maximum results from his low budget. The film was well shot--Riley has a cinematographer’s eye--and well edited; and the movie documents the world of Jim Tom in a straightforward manner that is neither judgmental nor condescending. It’s easy to see why this short collected awards on the festival circuit. If I had to offer any criticism of the film, I would suggest that at 22 minutes, Moonshine is too short. Just as we begin to get to know Jim Tom and his community, the movie is over. Riley’s subjects are just as interesting as the characters covered in Chris Smith’s American Movie (1999) and Errol Morris’ Vernon, Florida (1982); and they could have easily carried a feature-length film. On the other hand, since Moonshine was a student film, funded in part by a grant from Entertainment Weekly, it may be that what we see of Moonshine is all that resources would allow. Whether the film is small due to budget restraints or by design, Moonshine is a tasty aperitif that leaves the viewer wanting more. Potent Quotables--JIM TOM: I got to wait until this warms up. That’s my alcohol breathalyzer. People that’s drunk moonshine in their life has to blow on these things. Video Availability--Moonshine DVD (CreateSpace). A small taste is below. 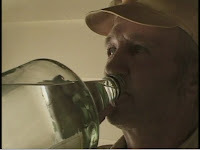 Similarly Sauced Cinema--Based on this clip on YouTube, it appears that Kelly Riley may currently be at work on a feature-length documentary on Jim Tom, Still Making Moonshine. Let’s hope that is indeed the case. 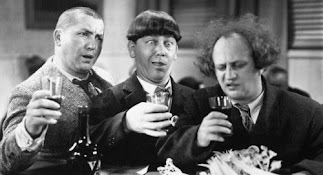 Most booze movie aficionados are familiar with "The Algonquin Roundtable" and "The Rat Pack" -- two informal social clubs of famous inebriates. However, between those two groups, there was a forgotten gang of celebrity souses -- The Bundy Drive Boys. Boasting a roster of Herculean hooch-hounds including actors John Barrymore, W.C. Fields, Errol Flynn, John Carradine, and Anthony Quinn; writers Gene Fowler and Ben Hecht; painter/art forger John Decker; and bohemian pants-wetter Sadakichi Hartmann; this boozy bunch was easily the most alcoholic and scandalous assemblage in Hollywood history. Although the escapades of the Bundy Drive Boys had previously been documented by member Gene Fowler in his 1954 book Minutes of the Last Meeting, Fowler had felt obligated to overlook the more sordid stories of the group out of loyalty to his friends and their families. Gregory William Mank and his collaborators were not restricted as Fowler had been. 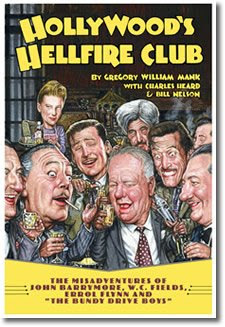 Consequently, Hollywood's Hellfire Club is an uncensored, pull-no-punches account of the alcoholism, sexual scandals, depression, financial woes, and madness within the group. At the same time, this well-illustrated page-turner paints an affectionate portrait of each of these great men; and the authors focus as much on the talent, wit, and accomplishments of the Bundy Drive Boys as on their difficulties and immoral behavior. 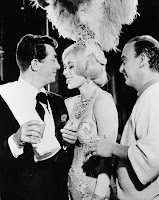 Hollywood's Hellfire Club is well-researched and does an excellent job at separating fact from legend, which is no easy task when your subjects include celebrated liars such as Fields, Barrymore, and Flynn. Certainly some of the stories contained between the covers have been exaggerated in re-tellings over the years, but that just adds to the fun. 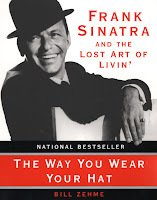 I think you'll find that reading this book is as entertaining as hanging out in a bar listening to a bunch of old-timers swap stories about Hollywood's golden days. In short, it's highly recommended. I'm beginning a new feature today at Booze Movies. The Soused Cinema Library will consist of capsule book reviews of recommended reads on the subjects of alcohol-related film and the great personalities who bent the elbow onscreen and off. 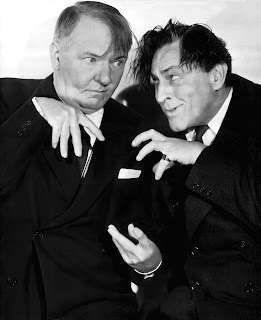 I may even feature a novel occasionally, as long as it has ties to the world of soused cinema. Think of "The Soused Cinema Library" as your hundred-proof alternative to "Oprah's Book Club." The first review will be up shortly.